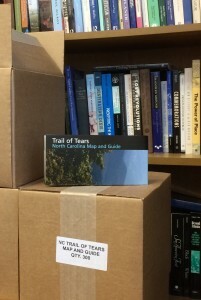 After much work, we are happy to announce that our new North Carolina Trail of Tears Map and Guide is complete and printed. Lynne Mager from the National Park Service’s long distance trails office designed the guide, which showcases some of the wayside exhibits detailed elsewhere on this website. NC TOTA members provided images, text, and maps. A grant from the Blue Ridge National Heritage Area Partnership supported printing. You can find a PDF of the guide here. To request copies, contact chapter president Sue Abram or board member Andrew Denson.